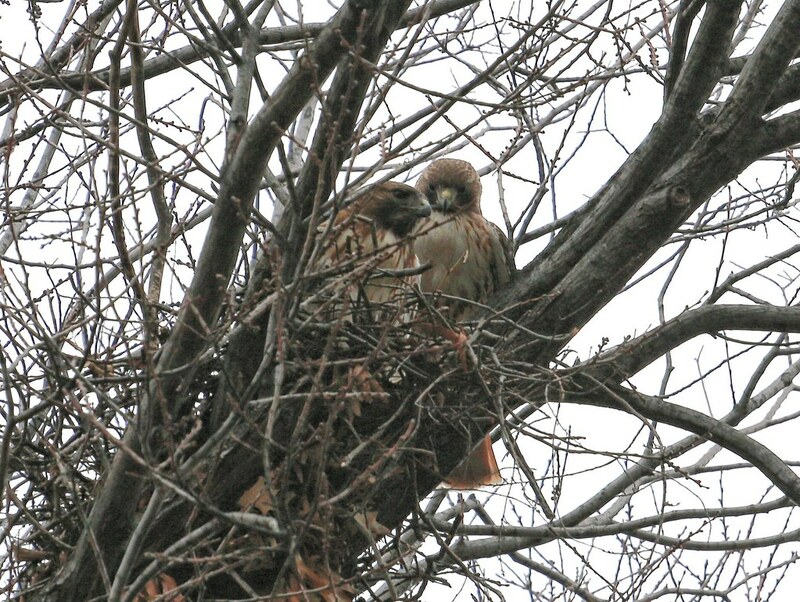 It looks like red-tails Christo and Dora are going ahead with using their newest nest in Tompkins Square. 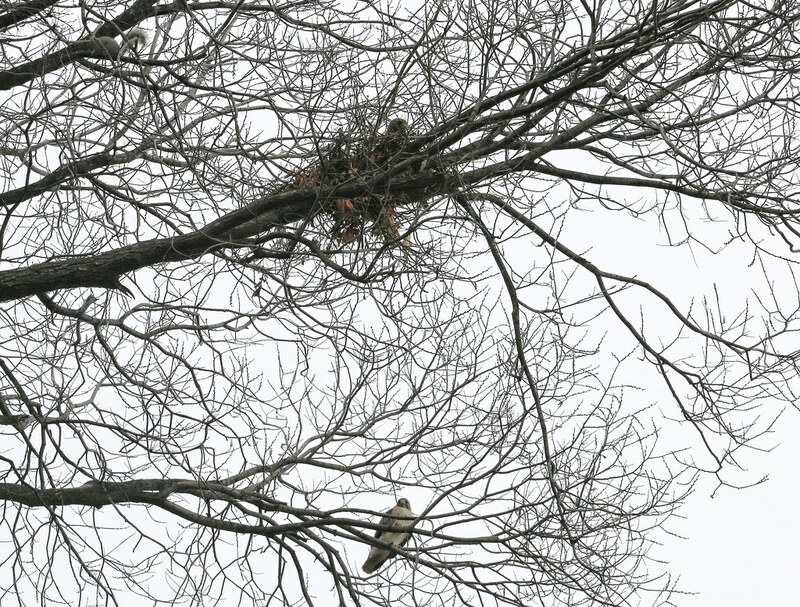 They've been working on it each day and, as far as I know, have not been seen at the previous nest in the ginkgo tree at all. 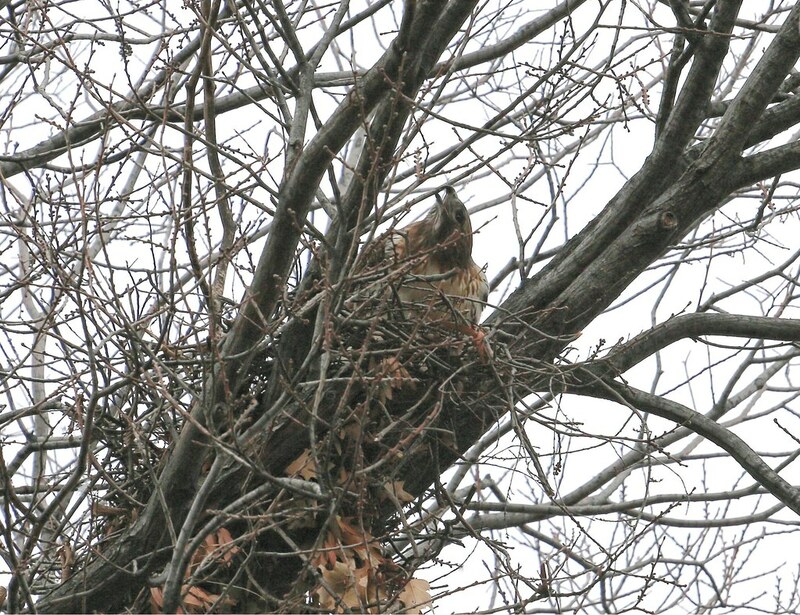 Below, Dora is in the nest while Christo looks on from below. Dora and Christo having a meeting. Dora trimming twigs from the nest tree (I believe it's an elm). 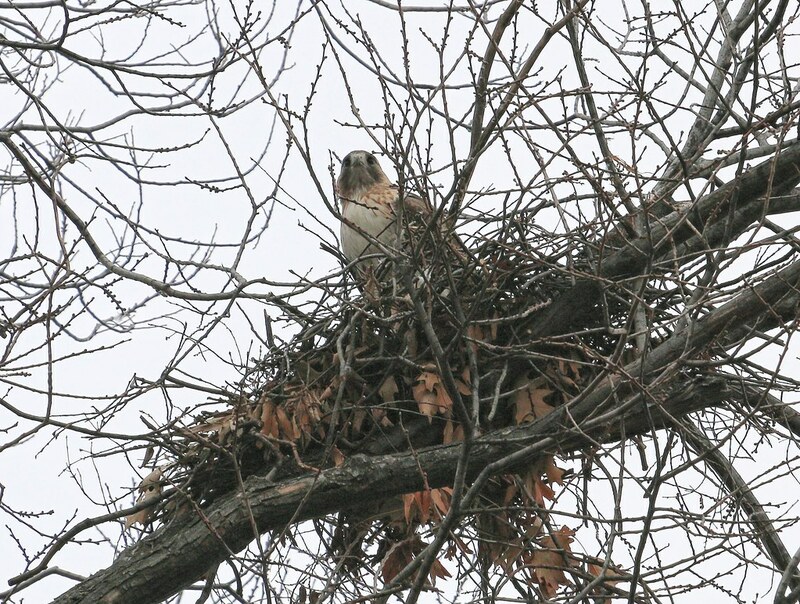 Above, Dora is in the nest while two squirrels investigate. This particular tree is home to several squirrels. I don't know how many live there, but I saw eight on the trunk at once a few days ago. This is also the same tree where, in 2014, Christo was intimidated by a gang of squirrels and all but fell out of the tree. 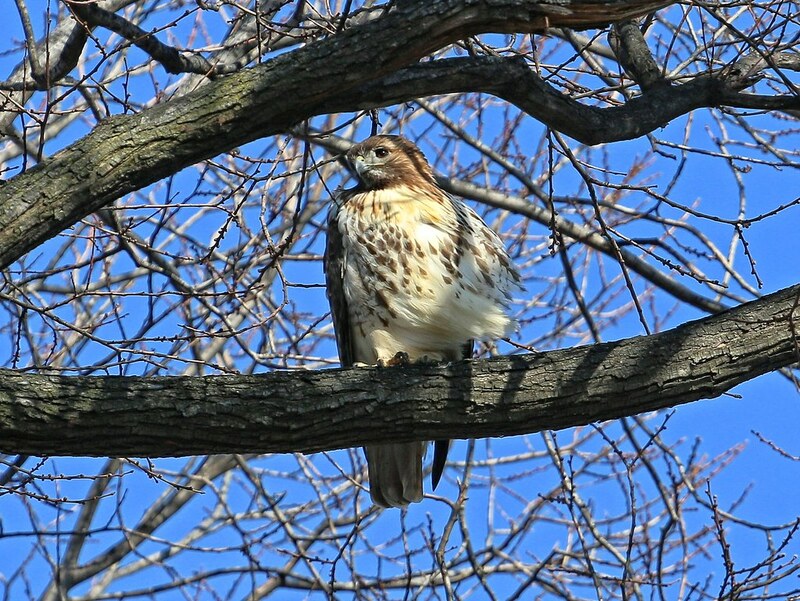 Hawks naturally prey on squirrels, but squirrels can also do serious harm to the hawks. Squirrel teeth are razor sharp and our Tompkins Square squirrels are pretty bold and tough. 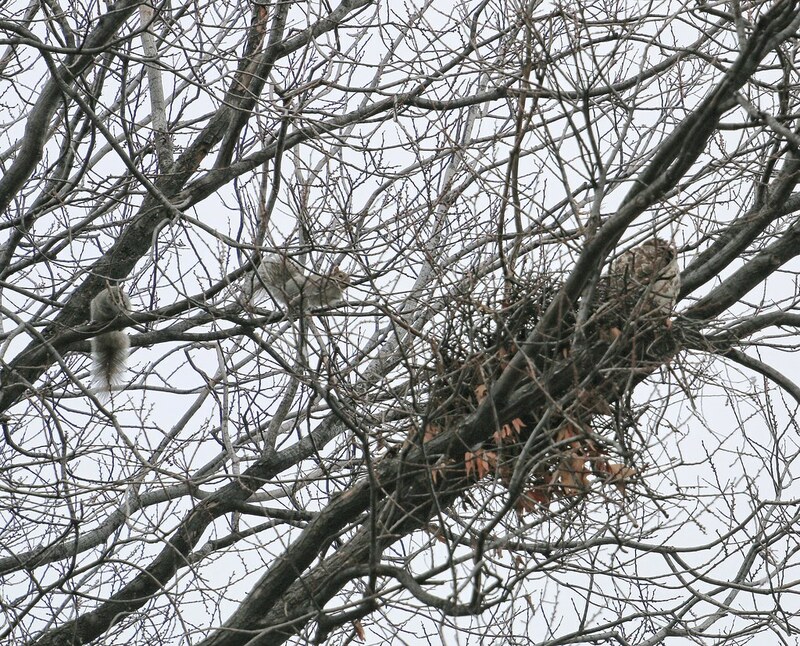 In addition to seeing a group of them go after Christo in the tree, I also witnessed a squirrel "war" over a tree on the east side of the park a couple of years ago. About 30 squirrels swarmed the ground and went to battle another group who were defending the tree. It was like a sea of squirrels and they all made a hissing sound I've never heard. At the time, I looked around to see if anyone else was witnessing the crazy event, but the only other person present was sleeping on a bench. Anyway, it was a bit terrifying and I've never seen it happen again. 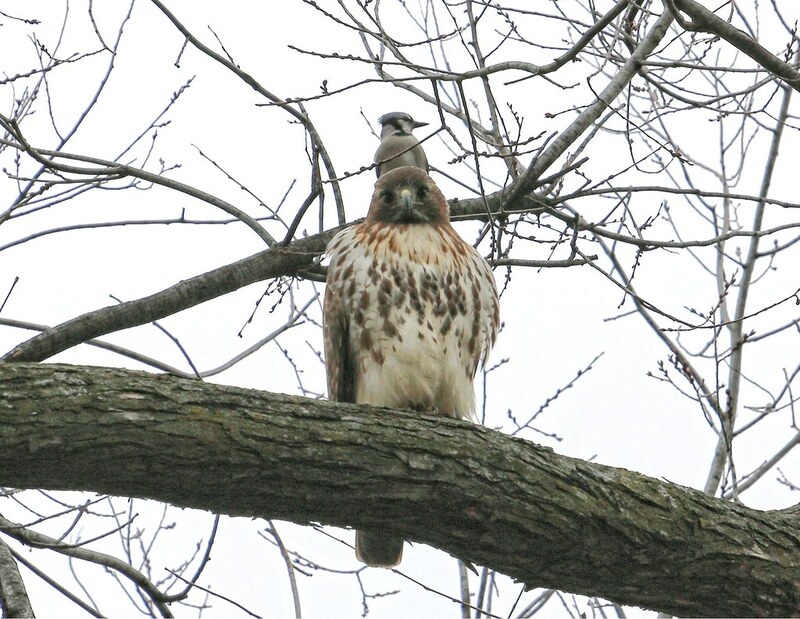 So, I'm just nervous about the hawks nesting in this particular tree. 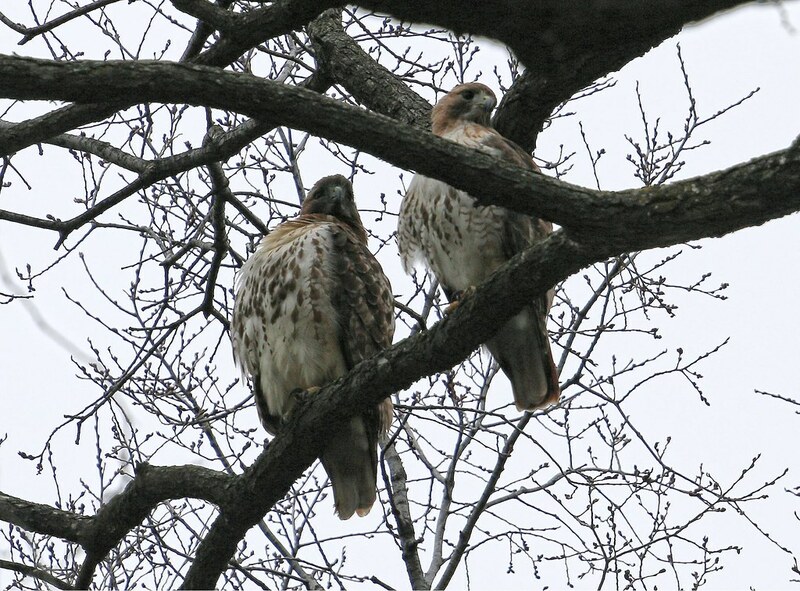 They are going to have to be extra vigilant to guard the nest (squirrels can prey on eggs and chicks), and the squirrels will need to stay safe by avoiding the nest. I'm really puzzled why Christo and Dora didn't decide to reuse last year's nest in the ginkgo, as it seemed to work out perfectly. Dora on the left, Christo on the right. 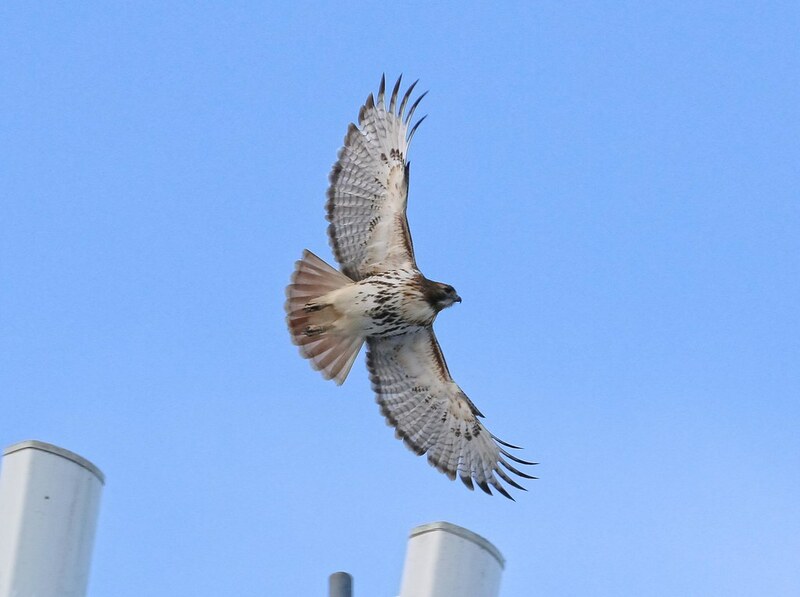 Below are a few more hawk pics from the last week or so. 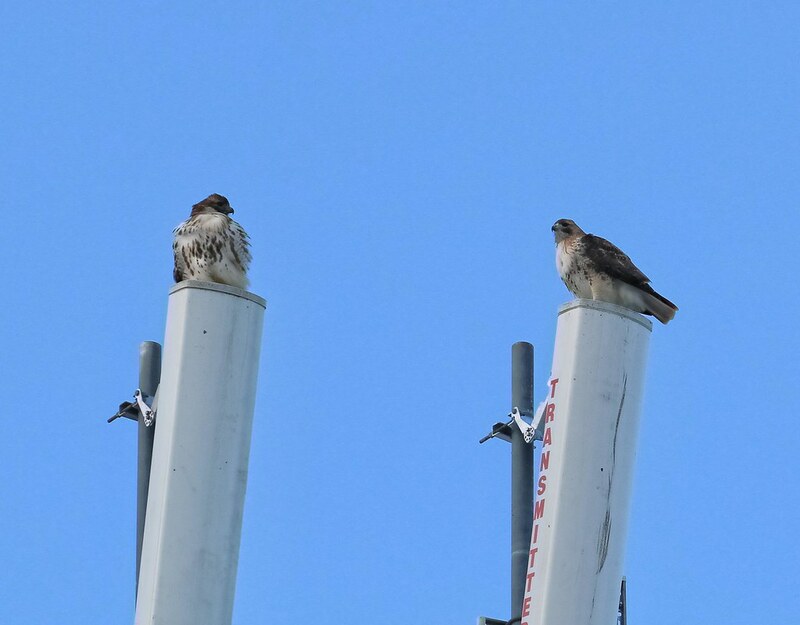 Dora and Christo hanging out on cellphone transmitters on Avenue A.
Dora and her swishy feathers in the wind. She often looks disheveled while Christo has a sleeker appearance. Dora with something on her head. Ha. 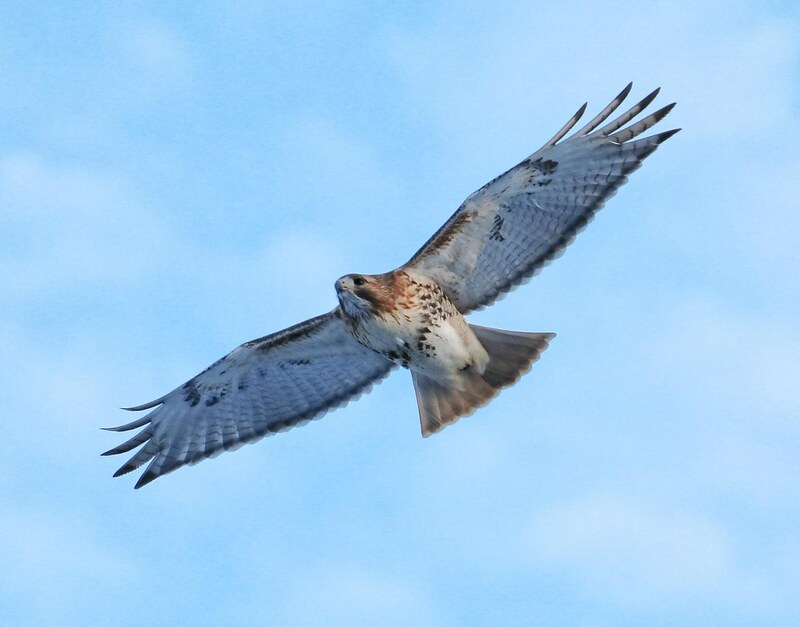 Dora showing off her beautiful wings and tail. Dora scouting out a roosting place at dusk. 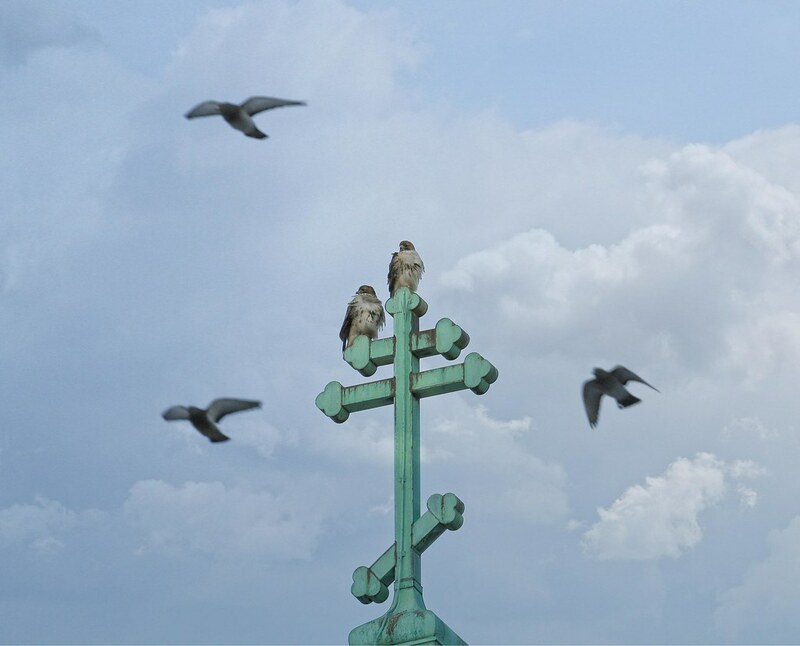 Dora and Christo on their lookout post atop St Nicholas of Myra at Avenue A and 10th Street. 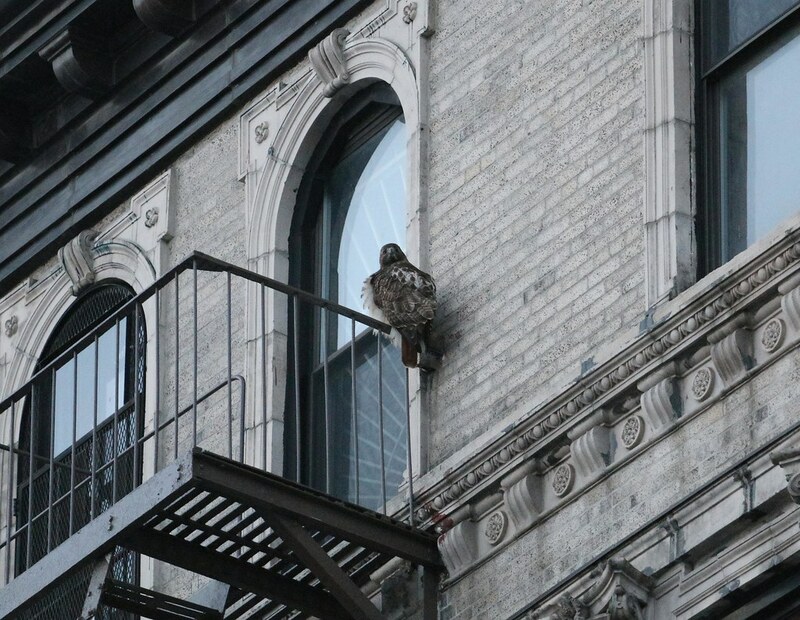 I will update on the nest as I know more.